Dream Short Track is a Dream event in Mario & Sonic at the Olympic Winter Games. Players need to reach day 12 after defeating Rouge or day 15 before defeating Eggman Nega. It takes place on the Egg Factory stage from Sonic Riders. However, the course has entirely lost its volcano/fire theme so that there can be ice on the track. Four teams of four will have a relay race around the track, avoiding the crates and screws along with items. If the character collects five rings, by pressing , the character will get a speed boost. During the second and last laps, the course will change slightly. In addition to this, there are some ramps near the end of the track that the player can jump off by flicking the Wii Remote up at the right time. Performing a "Perfect" jump will cause the player to jump right over an upward slope, which would usually make the player lose speed. 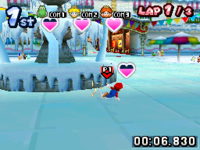 Getting the Blue Coins in this event requires players to take both paths of the track. Dream Short Track also appears in the Nintendo DS version referred to as Intense Short Track but it is set on a boat. The objective of this game is to reach the goal and skate through three laps. The obstacles of this game are pitfalls that are caused when players accelerate on the cracked ice. Stamina is provided during the race. Using and allow the player to accelerate and allows the player to jump. This page was last edited on March 9, 2018, at 21:47.